Charles Dickens, born in February 1812, is a writer who presumably needs no introduction. Many of his characters and stories are part of the cherished fabric of readers of English literature—Oliver Twist & Fagin, Pip & Miss Havisham, Tiny Tim, Bob Cratchit, Ebenezer Scrooge, and all the rest. After a difficult childhood, Dickens started his writing career as a journalist and editor of several popular magazines. His first collection of essays and stories, Sketches by Boz (an early pseudonym derived from a family nickname) was published in 1836. Dickens was only twenty-four years old and not well known as a writer. His illustrator, George Cruikshank, was twenty years older and already an established graphic artist. The second series of Dickens’ sketches, generally known as The Pickwick Papers, is the work that made Dickens famous, almost overnight. 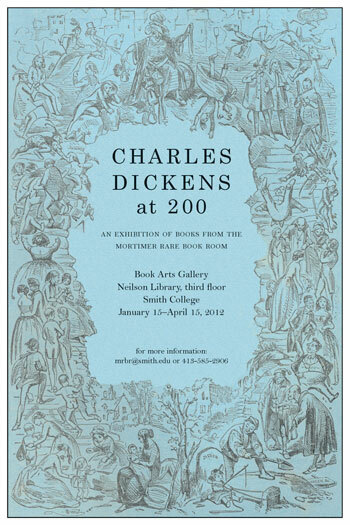 Dickens was a prolific writer, and his popularity flourished during his lifetime and well beyond his death in 1870. His many works were illustrated by a number of the Victorian era’s most notable graphic artists. Many of Dickens’ novels, as well as others of the time, were published as serials, in weekly or monthly parts, stitched into printed paper wrappers. This meant that the novels didn’t have to be, or seldom were, complete when publication began, resulting in the use of the “cliffhanger,” a suspenseful end to each section of the novel, intended to guarantee the reader’s interest and eagerness to purchase the next installments of the story. 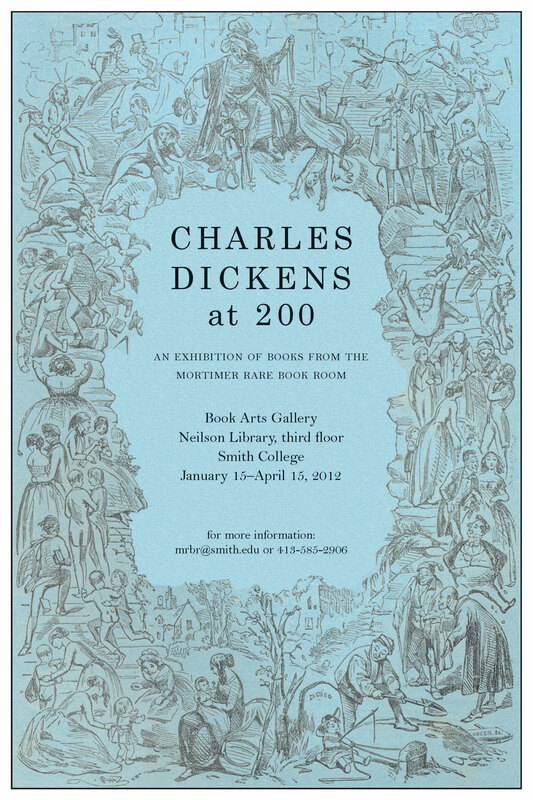 The Mortimer Rare Book Room has a notable Charles Dickens collection, including a number of his novels in “original parts.” The bulk of the Dickens material was a gift to the library in January 1965 (and exhibited here in February of that year) by Helen Dunbar Holmes, class of 1909. The exhibition was on view in Neilson Library through April, 2012. Start here to view the the exhibition in order using the "next image" link at the bottom of each page, or use the "return home" links to return to this page and select an image you would like to view individually. "So, I called myself Pip"
Exhibition written by Barbara Blumenthal. Online exhibition created by Elizabeth Sheirer.